Specialised Orthotic Services have designed a version of its very successful Mojo Tilt in Space Wheelbase called the Mojo CC Wheelbase (Complex Care). This new development from SOS draws on our years of experience in dealing with clients who have very complex needs with regard to daily healthcare. 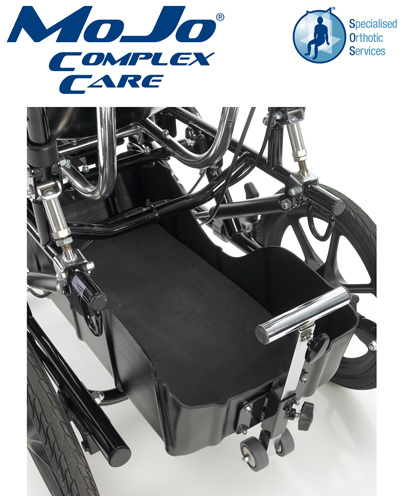 The Mojo CC Wheelbase brings an innovative approach to mobility for complex needs clients who require convenient access to specialised medical equipment as part of daily living. The MoJo CC was developed for clients with very complex needs and depend on specialist equipment such as ventilators and oxygen to manage their clinical needs. Accommodating equipment on a standard wheelchair is often difficult and can affect the wheelchair’s centre of gravity making it unstable. So SOS designed the MoJo CC specifically for this requirement. The MoJo CC has a retractable carrier positioned under the wheelbase which allows for accommodation for any equipment need. It is designed to simply slide out from underneath the wheelbase, making access to store and monitor equipment simple and safe. Suitable for a wide range of seating systems the MoJo CC is a practical solution designed to make life easier for carers and support staff whilst providing a practical means of mobility. All MoJo wheelbases are Crash tested and are fitted with tie down points for transportation. Available in Midi & Maxi Tilt in Space versions, suitable for children and adults. It can be used with a wide range of seating. Easy fit and removal of seating with exclusive SOS Quick Lok Interface. Large under seat storage for accommodation of equipment. 16” rear wheels and swivel action front wheels. 2 position rear wheel setting. Suitable for transportation in adapted vehicle. Specialised Orthotic Services Ltd, is one of the leading specialist seating providers in the UK. 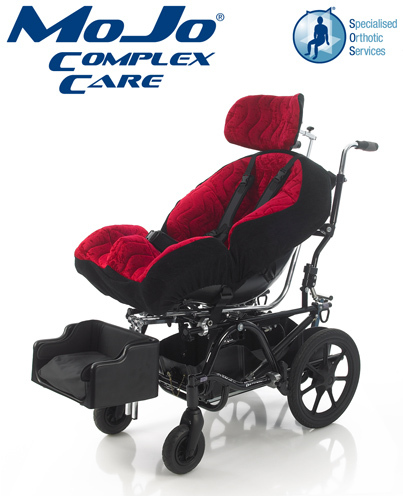 We offer a unique range of seating, mobility and positioning products and clinical services to the health care market. Our seating service is available throughout the UK and our highly skilled seating specialists offer advice and guidance to ensure clients receive the best possible seating solution within a 4 week assessment/supply cycle. For more information please contact Specialised Orthotic Services using enquiries@specialorthotic.com or call us on 01283 812860.